There’s a chapter in the Tanakh that used to be read in the Synagogues as part of the Haftarah (yearly reading), but later the rabbis decided to take it out of the Haftarah reading. 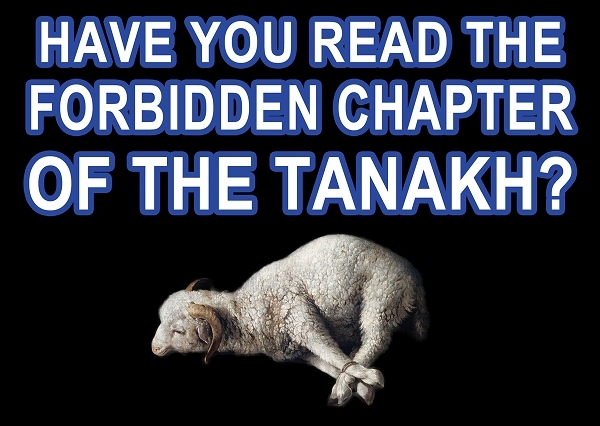 Today, it is considered to be the “forbidden chapter.” Have you heard about it? Do you want to read what’s in this chapter? The “forbidden chapter” is Isaiah 53. It is a very important prophecy about who the Messiah would be. For 1,700 years after Isaiah wrote it, virtually all of the rabbis and sages believed the chapter was speaking about the Messiah. Now it’s time for you to read this chapter, to see what it says. 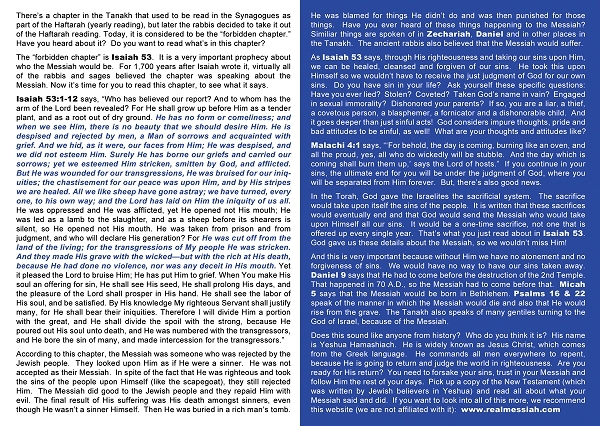 According to this chapter, the Messiah was someone who was rejected by the Jewish people. They looked upon Him as if He were a sinner. He was not accepted as their Messiah. In spite of the fact that He was righteous and took the sins of the people upon Himself (like the scapegoat), they still rejected Him. The Messiah did good to the Jewish people and they repaid Him with evil. The final result of His suffering was His death amongst sinners, even though He wasn’t a sinner Himself. Then He was buried in a rich man’s tomb. He was blamed for things He didn’t do and was then punished for those things. Have you ever heard of these things happening to the Messiah? Similiar things are spoken of in Zechariah, Daniel and in other places in the Tanakh. The ancient rabbis also believed that the Messiah would suffer. As Isaiah 53 says, through His righteousness and taking our sins upon Him, we can be healed, cleansed and forgiven of our sins. He took this upon Himself so we wouldn’t have to receive the just judgment of God for our own sins. Do you have sin in your life? Ask yourself these specific questions: Have you ever lied? Stolen? Coveted? 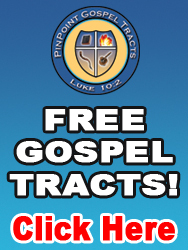 Taken God’s name in vain? Engaged in sexual immorality? Dishonored your parents? If so, you are a liar, a thief, a covetous person, a blasphemer, a fornicator and a dishonorable child. And it goes deeper than just sinful acts! God considers impure thoughts, pride and bad attitudes to be sinful, as well! What are your thoughts and attitudes like? Malachi 4:1 says, “‘For behold, the day is coming, burning like an oven, and all the proud, yes, all who do wickedly will be stubble. And the day which is coming shall burn them up,’ says the Lord of hosts.” If you continue in your sins, the ultimate end for you will be under the judgment of God, where you will be separated from Him forever. But, there’s also good news. In the Torah, God gave the Israelites the sacrificial system. The sacrifice would take upon itself the sins of the people. It is written that these sacrifices would eventually end and that God would send the Messiah who would take upon Himself all our sins. It would be a one-time sacrifice, not one that is offered up every single year. That’s what you just read about in Isaiah 53. God gave us these details about the Messiah, so we wouldn’t miss Him! And this is very important because without Him we have no atonement and no forgiveness of sins. We would have no way to have our sins taken away. Daniel 9 says that He had to come before the destruction of the 2nd Temple. That happened in 70 A.D., so the Messiah had to come before that. Micah 5 says that the Messiah would be born in Bethlehem. Psalms 16 & 22 speak of the manner in which the Messiah would die and also that He would rise from the grave. The Tanakh also speaks of many gentiles turning to the God of Israel, because of the Messiah.